Nature’s Décor™ varieties have been especially selected to fill a garden with texture and colour ensuring performance, outstanding habit and flowering quality. Our Nature’s Décor™ range is ‘The Growers Choice’. We regularly increase the selection of material available in the Nature’s Décor™, which offers a wider choice of plants well suited to garden beds, landscapes, mixed containers or baskets. The seed and vegetatively raised plants of the Nature’s Décor™ range are available in a range of cell trays with labels available in bundles of 50 from Norwood, making this a well co-ordinated program for growers to market to retail. 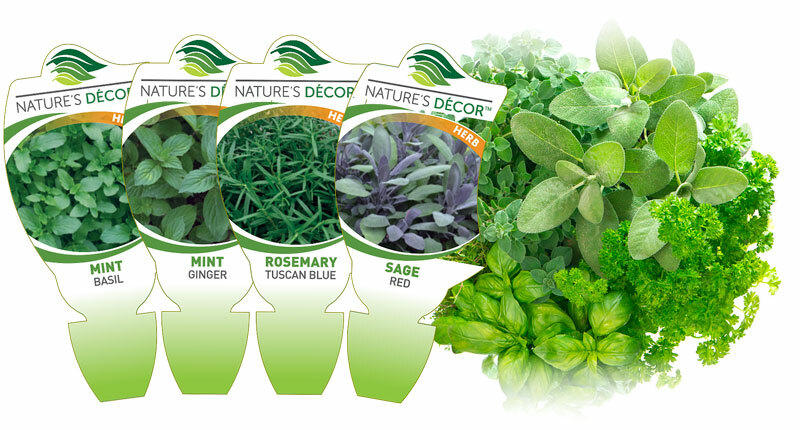 Nature’s Décor™ Herb range has an extensive collection of vegetatively raised plants that offer all time favourites plus new varieties for interesting flavours. All are grown for their leaves for culinary purposes or as ornamental and fragrant edging for garden beds and pots. All Nature’s Décor™ products are available at all good Garden Retailers Australia wide.